The truth is that there are no super parents. We all struggle, and we all need help to stay on course. Old Story New makes it easy for parents to stay on the life-giving course of sharing the gospel with their family. 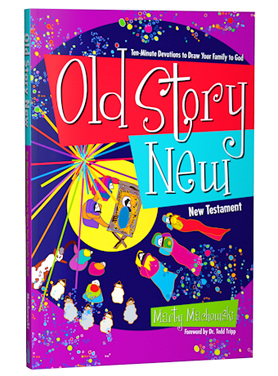 The second volume in Marty Machowski’s family devotional series, Old Story New continues the gospel story that started in Long Story Short. Using the same effective ten-minute a day structure, it walks children through the great truths of the Christian faith in the New Testament. Through 78 New Testament stories, Old Story New does the hard work for parents and caregivers. Simple discussion questions (and answers!!) for each day’s devotion help children understand and remember Jesus’ life, death, resurrection, and the birth of the Christian church. Old Story New is a family devotional program designed to explain God’s plan of salvation through the New Testament and is suitable for children from preschool through high school.